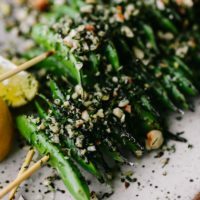 Grilled Snap Peas with Hazelnut-Dill Crumb | Naturally. Skewer a meal: Add halloumi or tofu to the skewers. I love the salty cheese paired with the hazelnut crumb. Nuts: Swap out the hazelnuts for almonds or pistachios. Stick with a flavorful nut- it adds quite a bit to the overall flavor of the dish. 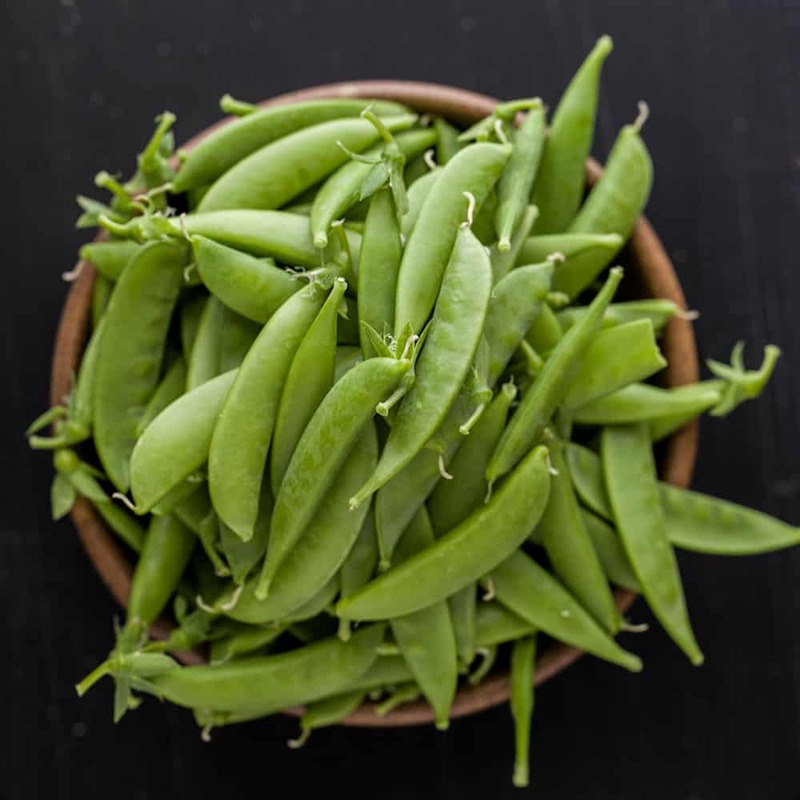 Bowls: Add these snap peas to a salad or grain bowl. Top with a sprinkle of feta cheese or your favorite grain sauce. I’d recommend pairing these grilled snap peas with this multigrain pilaf and lemon vinaigrette. If using wood skewers, soak in water for an hour before grilling. Snap the end of the peas and remove the strings. Place in a bowl and toss with 1 tablespoon olive oil and the salt. Thread onto the skewers, roughly 8 to 10 per skewer. Alternatively, you could skip the skewer and use a grill pan. Grill the snap peas, turning once, until charred and bright green. 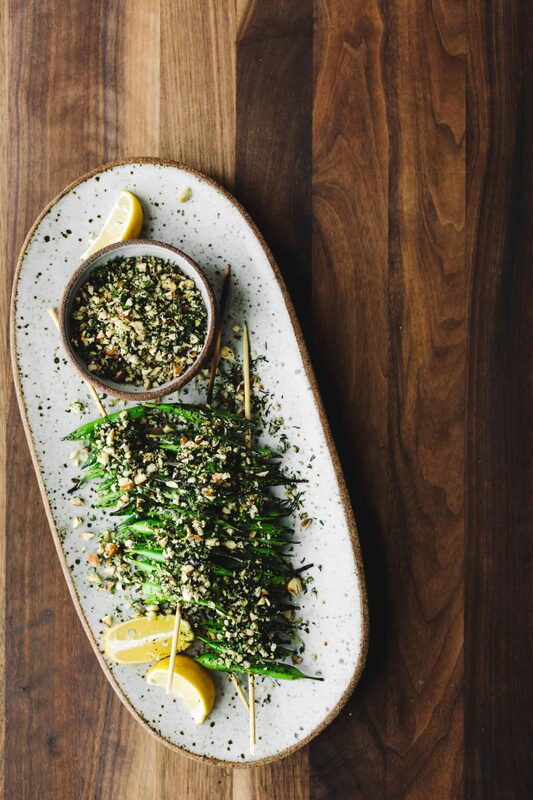 Place the hazelnuts on a cutting board along with the fresh dill, garlic, zest, and garlic. Chop/mince everything until is well combined and resembles breadcrumbs. Alternatively, use a food processor. 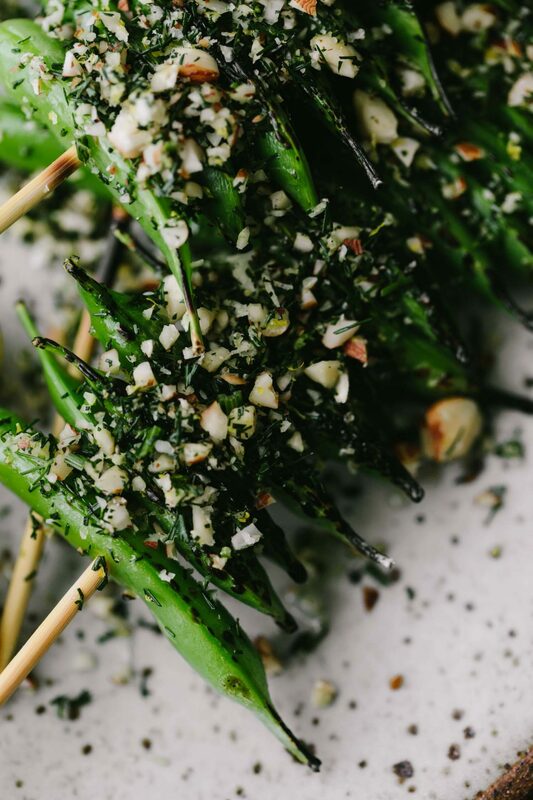 Serve the snaps peas with a drizzle of olive oil and a heavy sprinkle of the hazelnut crumb. 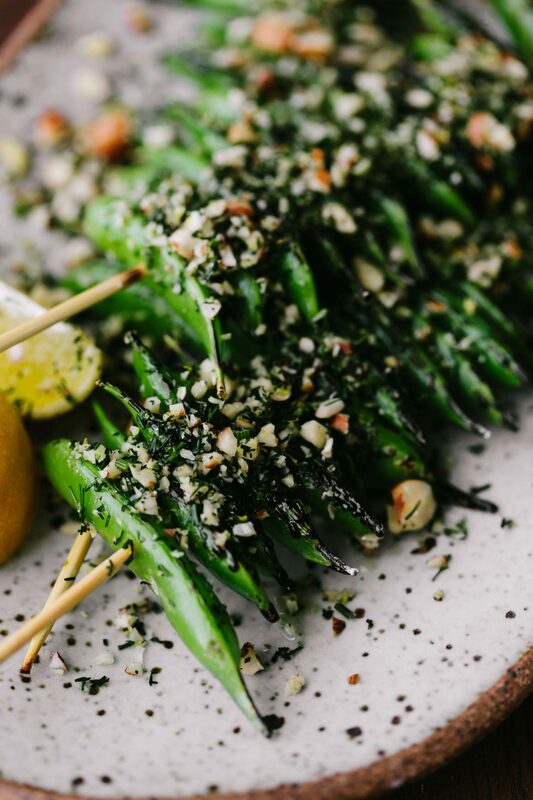 Tips and Tricks: As mentioned, you could skip the skewers and place the snap peas on a grill pan. As mentioned above, snap peas are a true spring treat. We typically eat them raw or I’ll toss them on the grill. Snap peas are great because when cooked well, they are tender but still have the perfect amount of bite. Keep snap peas in an airtight container in the refrigerator and have a solid snack for the entire week!